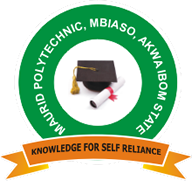 Maurid Polytechnic, Mbiaso, Akwa Ibom State National Dipoma, ND, Higher National Diploma, HND and Degree Admission Form, Courses, Eligibility, Admission Requirements, Application Guidelines for 2018/2019 Academic Session. Authorities of the Maurid Polytechnic, Mbiaso, Akwa Ibom State has announced the sales of admission forms into the various National Diploma, ND, Higher National Diploma, HND and Degree programmes for 2018/2019 academic session. Students who have written Jamb and scored 150 and above are eligible to apply for admission in the Institute. Such a student must possess a minimum of five (5) credits passes in relevant subjects. Candidates must possess a minimum of five (5) credits passes in relevant subjects. Applicant is required to register for maurid eportal to complete registration for his/her choice of programme, and can check the portal from time to time for new updates. Visit https://mauridportal.net/ for more information.